My husband of 12 years is handsome and smart. He’s geek chic. A software engineer in his first career and a man of the cloth in his second. He has gorgeous eyes that I still can’t decide if they are brown, green, or hazel. He has an infectious laugh and a heart-warming smile. He is hard working and cares for his family. For these reasons and many more I love him. That love grows with each year that passes. He is the perfect man for me. In the midst of living life, sometimes I forget to tell him or show him just how much I love him. But then this opportunity presented itself. As part of my job I read books about leadership, entrepreneurialism, and motivation. I read these books with two purposes: fulfill my job requirements and mine for gold. Each book needs to yield at least one golden nugget of information or insight that I can apply in my life. August of 2011, I had to read The Compound Effect by Darren Hardy. In the book the author challenges a friend to spend a year writing down at least one thing each day that he loved or appreciated about his wife. Hardy had done the same for his wife as a gift for Thanksgiving. A gift of gratitude and expression of love. That was my golden nugget. I decided to take the challenge. It wasn’t easy because on days when I was frustrated or angry or just tired, I couldn’t write a journal entry. Plus the instructions state that you shouldn’t repeat something you’ve already written about … characteristics, tasks, and actions, should only receive one entry. 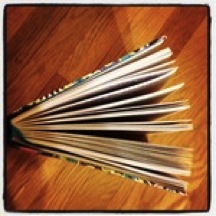 But the journal became a journey of understanding the impact gratitude can have on our lives. Remembering that what we focus on is what we are surrounded by. Starting every entry with “Thank you for …” grew tiring. It got stale and boring. I didn’t want this gift to be described with such adjectives. I invested time in finding quotes and poems and phrases to include in the journal. The more I searched and the more I wrote, I found that it made me talk to my husband differently within the moment. Life was no longer getting in the way of me saying, “Thank you,” and “I appreciate you.” I was thinking about being thankful beyond having something to write down for him to read a year later. On his birthday yesterday I gave him this gift. Hopefully, it’s a gift that keeps giving. A keepsake of my love for him, written in my own hand. A gift he didn’t know I was creating for him as he watched me journal night after night. Sitting next to me in bed he watched without knowing I was writing about him or for him. Will you take this challenge? Maybe a short one … between now and Thanksgiving or Christmas? Take the time today and every day to express your love to that special someone. Or, may be you already have. If so, share how the gift was received. You may have a special challenge pulling this off in secret if your hubby reads over your shoulder but it was a lot of fun for me. Good luck. Thanks for reading. It was a good exercise. I am thankful to have been able to do it. And journaling has always helped me deal with what I am feeling. So, I’d say writing is key to my world. Thanks for reading! What an incredible gift. I’m currently spending a lot of time abroad, halfway across the world from most of my loved ones, so I’ve been thinking a lot about them and what each of them means to me. This sounds like the perfect thing to do for my parents. Thank you for the inspiration and the challenge! Wow … sounds like your on an amazing adventure. 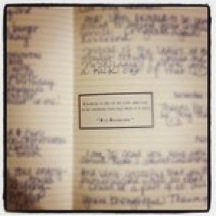 Absence makes the heart grow fonder, so a gratitude journal would be a beautiful gift to bring home to your parents. I hope you and your parents enjoy it. This is such an amazing idea, I am so moved by your dedication to keep it up (and keep it hidden) for a year. I have a young daughter, and I think it would be such a wonderful idea to do something similar for her, but from both her father and I. Thank you for inspiring me! My husband and I discussed doing this for our boys. We even purchased the journals but haven’t been dedicated. I think this next year we’ll do it and label the inscription: Love Letters to My Son. I don’t have anything in my dad’s handwriting. I wish my mom and dad had done for me. Thanks for reading. What a beautiful idea – and a great use for a pretty notebook and pens! 😉 No really, that is such a special idea….I may take this challenge. Thanks for the inspiration! It allowed me to use pretty ink pens and buy a cool journal. LOL. But I like that it made me think of different reasons I love and appreciate my husband. It’s always about the pens. Sigh. When Andy told me about this gift I was speechless. I heard emotion in his voice as he told me about the best gift ever. A gift of a lifetime. I’m guessing, just a thought, that there were days when you had to think long and hard for thankfulworthy actions, qualities, or situations. He’s sooo blessed to have found you. Hugs. I am glad he likes it. He means the world to me. It was hard at times but now it seems weird to not be writing each night. Thanks mom!